Over the past year, in an effort to eliminate wasted food, I have been experimenting with making casseroles using leftovers. This is a foolproof recipe that is quick, easy, family pleasing, and a great way to use up any leftover turkey from the holidays! You can also use leftover chicken in place of turkey for an equally delicious family dinner. 2. Melt butter in saucepan over medium heat. Stir in flour and cook for 2 minutes stirring constantly. While stirring, slowly add the chicken broth, milk, salt and pepper. Cook for 2 minutes, stirring frequently, until smooth. 3. Remove from heat. Stir in turkey and vegetables until well combined. 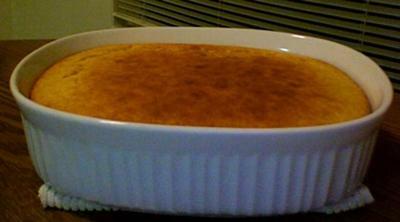 Spoon mixture into a 1-1/2 quart baking dish and spread evenly. 4. In a medium bowl, combine corn meal, flour, sugar, baking powder, and salt. 5. In a separate bowl, mix oil, egg, and milk until well blended and add to dry ingredients. Use as few strokes as necessary to blend ingredients together well without over blending. 6. Spoon batter on top of turkey mixture in baking dish. Spread evenly. Bake for 25 minutes or until top is firm and golden brown. Serves a family of 6 generously. This will be great for all the turkey leftovers from thanksgiving and Christmas. Great use of leftovers. Thanks! 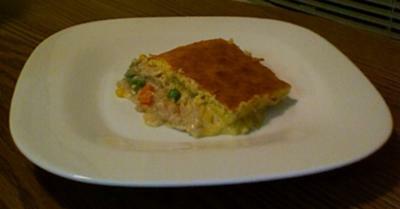 I loved the turkey cornbread pot pie recipe and I don't cook! Looks very good, we will try it. turkey,but I will try this recipe with the cornbread the next time,it sounds delicious. Delicious! Its my new fave recipe! Liked this because it created a whole new meal with leftovers!! Thanks! This was easy for me to make and my family loved it! My family loves pot pies and this is a nice change from the traditional recipies. Its easy to make and delicious. I will definitely be making this again for my family. Great food and helps stretch our food dollars!! Fantastic. I couldn't get enough of it! My wife made this and I couldn't stop eating it. Absolutely addictive! I would recommend it to everyone! was a great way to use up leftover turkey. I have enough turkey and will make this one again next week!! !